Formed in 2003 by three Oslo-based musicians, Andreas Stensland Løwe (piano, synths, electronics), Jo Berger Myhre (double bass) and Andreas Lømo Knudstrød (drums, percussions), Splashgirl released their first album, Doors. Keys. on AIM Records five years later. Two years ago, their second opus, Arbor, Norwegian imprint Hubro’s very first release, saw them moving away from the clearly defined jazz forms and purely acoustic instrumentation of their debut to accommodate for a wider range of genres to feed into their music. Whilst their compositions are undoubtedly rooted in contemporary jazz, their debut drawing comparisons to Christian Wallumrød, Trygve Seim or Paul Bley, the band name Eric Satie, Earth, Morton Feldman, Steve Reich or Oren Ambarchi amongst their strongest influences. 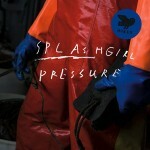 With their third album, released once again on Hubro, Splashgirl continue to expand their sound, integrating for instance elements of post-rock into their spartan formations, and while their music remains predominantly acoustic, they accentuate its relief with discreet electronic touches and processed sounds. To help pushing their boundaries, Splashgirl rely here on a handful of outside contributors, of which guitarist Juhani Silvola is the most instantly noticeable. He intervenes on five of the album’s seven tracks, at times providing gentle touches (Alpha State Of Mind) or smart counterpoints to Løwe’s piano (Devata, Creature Of Light), at others cutting through the torpor to give the trio’s music a sharper, more incisive tone (The Other Side). The music of Splashgirl is all delicate nuances, impressionist touches and restraint, yet on Pressure, the trio dare more angular structures, whether it is the distressed saturated guitar toward the end of Devata, the sombre mood of The Other Side, where both guitar and bass seem to drag the piece down an increasingly dark alley, the frantic piano work and contrabass bowing on Concerning This Square, or the layered metallic screeches which infiltrate part of the title track. This opens up the trio’s music to new grounds, but it retains the elegance and fluidity which made Arbor especially such a compelling record. If anything, these actually given more poignancy here as the band have gained considerable maturity as a formation. Pressure is a much more contrasted record than its predecessor, one that never quite settles where expected. The music may at first appear gentle and peaceful with Splashgirl, but below the surface lie more rugged landscapes, yet it can take time to reveal them in their entirety. Pressure doesn’t brag loudly about its credentials, but it is a quietly confident opus by a trio who are rapidly gaining confidence.